Somewhere, from the counter of the all-night doughnut shop in the sky, Buford T Justice is shaking his fist in the direction of the United Arab Emirates. With their recent acquisition of an Aston Martin One-77, police in the city of Dubai have made driving a squad car look a lot more interesting. The bespoke coupe, limited to a run of 77 examples, has less to do with helping officers solve crimes than with enhancing Dubai’s hyper-rich image. 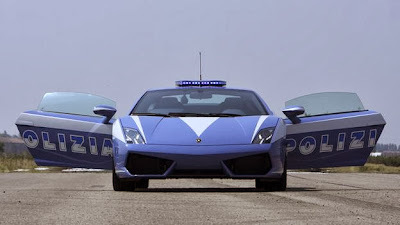 While it is not the first time that a police department has drafted a supercar into service, Dubai’s latest action has certainly upped the game. Workaday, sedan-based squad cars factor less and less in the world’s police departments, and officers have grown accustomed to protect and serve from behind the wheel of faster, more luxurious vehicles of varying body styles. But some vehicles blow out the departmental spend sheets. And while nobody would hope to score a ride in these cars’ back seats (where back seats exist), there is a lot to like about law enforcement when it is administered in such machinery.